A lot has happened this week. We’ve launched WickedGoodGaming.com, Star Wars Day has arrived again, I might’ve overdrafted from my bank account, and today marks the four-year anniversary of the death of one of hip-hop’s greats – MCA of the Beastie Boys. Hip-hop and video games are two things that have very special places in my heart. Just like gaming, some people primarily use music as an escape from the outside world, and hip-hop music is one genre in particular that is especially colorful with it’s storytelling. Since the 90s, many rappers have mentioned or referenced video games in their songs as signs of status or in simple tribute to their favorites, and some emcees even work with game developers to use their music to contribute to a game’s soundtrack. However, as diverse and widespread as gaming’s appeal is, there have been only very few true “hip-hop video games” during it’s long and storied history. Many people I’ve talked to are simple believers that there is no such thing as a great hip-hop video game, and that there is no way to make one. Well, my friends – I’m here to prove those people wrong. Without any further ado, here’s my list of the greatest hip-hop games of all time, as well as some of the worst. Enjoy. Kicking off our list of the worst moments in hip-hop gaming, we have 50 Cent: Bulletproof. 50 Cent’s 2005 third-person shooter certainly wasn’t the worst game I’ve ever played, but was little more than a quick cash-in on gaming hip-hop fans at the apex of the rappers’ success. Bulletproof starts the story by betraying its own title – with 50 Cent being shot nine times and left for dead. While the shooting is a big part of 50’s real life story, the video game version flavors the reasons behind the attempted murder with a story of conspiracy and betrayal, which would’ve been pretty cool to play through if the control system wasn’t so poor. 50 brings all of his friends along for this absurd ride, all of whom provide their own voice acting to the story mode. The soundtrack, one of the game’s strengths, is pretty much just a catalog of 50 Cent’s music as of 2005, including some extra material from Tony Yayo, Lloyd Banks, and Young Buck. 50 learned from his mistakes and release a sequel to Bulletproof in 2009, called “Blood On The Sand”. BotS was more or less just a blinged-out version of “Gears of War” – and is shockingly one of the best co-op shooters that the Xbox 360 and PS3 have to offer. When it was announced in 2004 that John Singleton, director of Boyz N The Hood, would be writing a gang-themed action game starring Snoop Dogg, many hip-hop and action film fans were excited. It wasn’t until 2006 that the news broke that Singleton’s “Fear & Respect” would never come to realization, and it left a void only to be partially filled later by the original Saints Row three years later. The prospect of the game was exciting, you’d play as “Goldie”, a well-respected 22 year old gang member voiced and modeled by Snoop Dogg, and would battle with rival gangs while earning “Respect Points” based on your clothing, actions, and income. So why was Fear & Respect cancelled? I guess we’ll never know for sure, but here’s hoping that Mr. Singleton gets the urge to get at the helm of a video game story again, because that’d be one game I’d love to play. I’m not going to sit here and act like I don’t love Sonic Adventure, or the sequel, because I do. Some of the game’s soundtrack is actually very good, namely anything that Crush 40 was responsible for. However, upon entering the first stage for one of the game’s protagonists, Knuckles, the player is hit with a god-awful rap anthem that is supposedly written from the red, dreadlocked echidna’s perspective. “Pumpkin Hill” is the name of the track, and Knuckles’ first stage, and is one of five songs written by “Hunnid-P” for all five of Knuckles’ stages. As a matter of fact, Hunnid-P has mentioned in recent interviews that he’s actually involved in a future Sonic project that is currently in development – and I hope it isn’t true. There’s not much to be said about Shaq-Fu that doesn’t mention its terrible gameplay, ridiculous story, and maddeningly short (3 songs total) soundtrack. Shaq-Fu is pretty much the Kazaam of video games, and is widely panned as one of the worst video games of all time. It’s okay Shaq Diesel, there’s always IcyHot. Get On Da Mic is the first of only a few hip-hop karaoke games in existence. The cover art features Jadakiss, who is widely considered to be one of the most talented artists in hip-hop history, but even Jada wouldn’t be able to get a perfect score due to Get On Da Mic’s horrifyingly bad mechanics. Even people who have the soundtrack memorized down to every beat and measure would have trouble getting the game’s pack-in microphone to pick up every single line, and the alternative PS2 Online Headset was not much better. All is not lost for hip-hop’s karaoke junkies however, as Def Jam Rapstar (released in 2010) is a gigantic step forward from Get On Da Mic’s original concepts. Something developers have yet to figure out, however – is that their Teen-rated games feature soundtracks that are laden with profanities. Nobody wants to rap the clean version. Nobody. With a mythology as deep and a fan base as loyal as the Wu-Tang Clan’s, it’s safe to say that a martial arts-themed fighting game featuring the emcees squaring off against evil ninjas would be a no-brainer. Shaolin Style tells the story of the Clan’s journey to rescue the last surviving master of Wu-Tang kung fu from the clutches of a rival master, and does so with fast-paced beat-em-up gameplay and a story so ridiculous that it’d have to be a martial arts film to be believed. Many remember Shaolin Style for it’s special edition controller (featured on the title card at the top of the page) which was incredibly cool looking, but overall uncomfortable to hold and borderline useless as anything but a conversation piece. Accessory gimmicks aside, Shaolin Style was one of the first video games to feature hip-hop figures as playable characters, and is still a load of fun to gather up some buddies and play to this day. As I mentioned in the beginning, some of the first appearances of hip-hop in video games started with the soundtracks. From hip-hop inspired instrumentals to original tracks to brand new mashups (thank you DJ Hero), hip-hop has been a part of video games for longer than most people think. EA Games and EA Sports have always been absolute juggernauts in the way of video game soundtracks, and NBA Street Vol. 2 will always have a place in my heart as one of the best soundtracks ever assembled for a video game. The old-school art style, clothing, rosters and menus in the game were all obviously inspired by hip-hop music and street basketball in the 80s and 90s – there’s no denying that. Just like many of the greatest producers in hip-hop history use samples from old funk, jazz and soul music to create new beats, NBA Street Vol. 2 used the inspiration from a forgotten era of basketball to create the ultimate letter to a culture that still beats loudly in the hearts and speakers of fans of hip-hop music and basketball to this day. The controls were tight, the soundtrack was impeccable, and the game even featured my personal favorite hip-hop producer, Just Blaze, as a playable character. NBA Street Vol. 2 was met with critical acclaim when it first released, and is still the most underrated sports game of all time in my eyes. If you haven’t played this game, go rustle up $6 and find a copy. You will not be disappointed. Marc Ecko’s Getting Up still stands to this day as one of the most ambitious and unique games I’ve ever played, and I’m still waiting on a proper sequel. Set in a dystopian futuristic setting, Getting Up follows the story of Trane, a young man who runs away from home to establish his name as a graffiti artist in a city and government that limits any and all artistic freedom. In this martial-law state, a corrupt mayor uses his own personal military police to suppress and destroy any signs of rebellion, creative freedom, or pretty much anything else deemed as inflammatory by the people running the city. Trane joins a crew of writers (graffiti artists) who are determined to help overthrow the corrupt leadership in the city of New Radius, and he comes across enemies, rivals and street art legends along the way. While criticized mainly for jumping off of the success of other open world games such as Grand Theft Auto III, Getting Up is a great game in it’s own right and is a hugely educational game in terms of street art, culture, and hip-hop music. Getting Up’s stellar soundtrack, great story, and unique gameplay form into one of the biggest representations of hip-hop and urban culture that gaming has ever seen, and I hope that one day Marc Ecko decides to delve into the world of gaming again and give us another one. The first installment in the Def Jam series, Def Jam Vendetta, was produced under EA’s “Sports BIG” studio. The game featured the biggest stars in rap music duking it out in a wrestling ring, and surprised wrestling fans, hip-hop listeners and critics alike when it was released. If the crisp, tight controls weren’t enough, EA threw in an entertaining WWF-esque love-and-revenge storyline into Vendetta, leaving fans like me wondering how the series could possibly get better. Enter “Def Jam: Fight For NY”, this time spearheaded by EA Games. FFNY is a 1-4 player fighting game that picks up right after the credits start rolling in the end of Vendetta, and improves on every aspect of it’s predecessor. What makes FFNY most unique is it’s extensive customization system, which allows the player to completely customize and fuse any combination of five fighting styles, by pairing up any two or mixing up to three together. Also, the combinations the player can use to create and customize their characters appearance are nearly limitless, from shoes to haircuts to chains and taunts. Fight For NY is the definition of what a sequel should be. FFNY features a seriously entertaining story, an even deeper roster of hip-hop stars and colorful original characters, and is endlessly re-playable with it’s variety of game modes and customization. Def Jam: Fight For NY is still to this day one of my favorite games of all time, and is easily one of the best hip-hop themed games ever. This is one game that begs for an HD remake or proper sequel, since the third game in the series, 2007’s flashy and shallow Def Jam: Icon, was a serious disappointment. EA, if you’re reading this, get on it. I know what you’re thinking, but hear me out. The 90s is the most beloved period in hip-hop history, and saw the birth (and death) of some of the greatest emcees that the genre has ever seen. PaRappa The Rapper came out in 1997, and is still loved for it’s catchy songs, lovable story and unique paper-thin art style, and is widely considered as being one of the best rhythm games ever released. PaRappa “the hip-hop hero”, is the titular character who finds himself hopelessly in love with a girl named Sunny, but feels like he can never get close to her because of the presence of Joe – a rich, overbearing character who is constantly all over her. Throughout the game’s stages, PaRappa makes significant strides in his life in attempts to impress Sunny, such as applying and testing for his drivers’ license – and even learning to defend himself. The game’s six stages each have a “teacher” who guide PaRappa and instruct him through rapping and dancing. PaRappa raps along based on how the player keeps with the beat, and the “U Rappin” meter serves as a constant judge of how “Cool” or “Awful” PaRappa’s skills are. I won’t spoil the ending, but PaRappa The Rapper is a fun, family-friendly and eternally memorable love story that has the underdog main character use the power of music to win the girl of his dreams. While this game is one of the only games on the list without a soundtrack featuring actual rappers or DJs, PaRappa The Rapper pays homage to the fun, energetic side of hip-hop that many kids gravitated towards, turning them into lifelong fans of the genre. So there you have it, my friends – the best and worst that the hip-hop games genre has to offer. 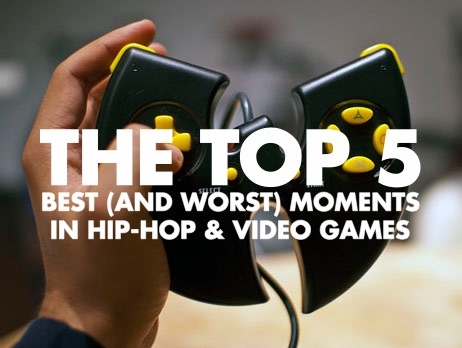 If any of the games on this list are an indication, the gaming industry has only a slight clue as to what makes a great hip-hop video game, but there’s still hope. EA Games has always been one of the best companies as far as soundtracks go, but it’d be nice to see more ambitious titles like PaRappa the Rapper and Marc Ecko’s Getting Up that truly think outside of the box when it comes to music, gaming, and how they can become something greater together. RIP MCA, and long live hip-hop.